l'Alsace divisee en Haute et Basse et le Sundgau. 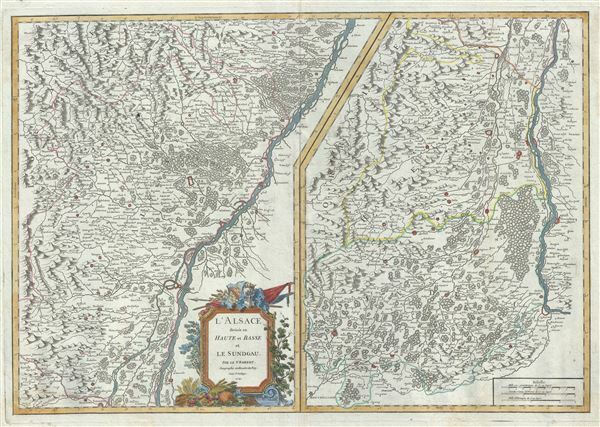 This is a scarce and beautiful 1754 map of the Alsace region of France by Robert de Vaugondy. Divided into two parts, the left section of the map features the department of Bas-Rhin and extends from Lauterbourg south to Dambach-la-Ville, France, while the right hand section depicts the department of Haut-Rhin and covers from Dambach-la-Ville south as far as Montbeliard. The map rendered the entire region in extraordinary detail showing roads, canals, rivers, cities, villages, chateaux, etc. Alsace is known for its fine white wines and along with Austria and Germany, this region produces the world's most desirable dry Rieslings. This mountainous area of the Alsace wine region and is known for its production of both Pinot Noir and Pinot Gris. The region surrounding Strasbourg on the west bank of the Rhine River is known for producing Munster cheese. A beautifully engraved title cartouche adorns the bottom right quadrant of the left section of the map. Drawn by Robert de Vaugondy in 1754 and published in the 1757 issue of his Atlas Universal. The Atlas Universal was one of the first atlases based upon actual surveys. Therefore, this map is highly accurate (for the period) and has most contemporary town names correct, though historic names are, in many cases, incorrect or omitted. Rumsey 3353.034. Pedley, Mary Sponberg Belle et Utile: The Work of the Robert de Vaugondy Family of Mapmakers, 127.